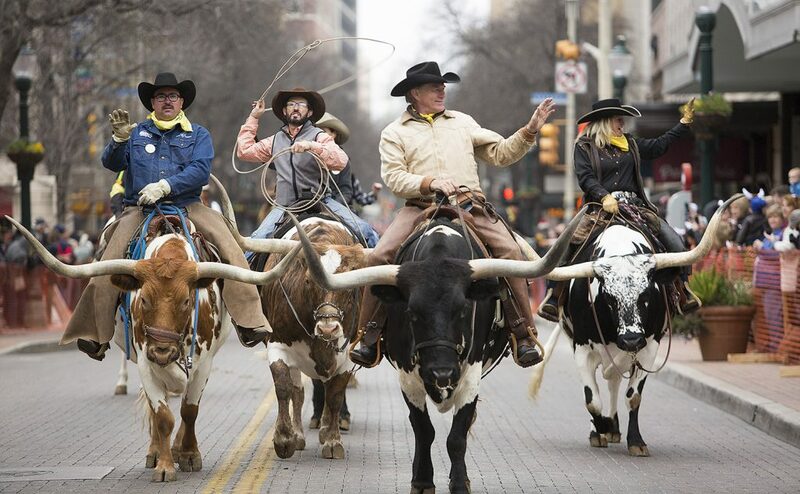 The Western Heritage Parade and Cattle Drive returns to Houston Street for the 12th year this Saturday. The parade starts at 11 a.m. under Interstate 35 on West Houston Street, then heads east on Houston Street, and south on South Alamo before ending at La Villita. The parade marks the beginning of the 70th annual San Antonio Stock Show and Rodeo, held at the AT&T Center and Freeman Coliseum grounds Feb. 7-24. City officials expect more than 40,000 people to line Houston Street to see roughly 100 cattle, 500 horses, and about 1,000 human participants. The first Western Heritage Parade and Cattle Drive in 2008 had 35 cattle, 60 participants, and 5,000 spectators, officials said. Among the riding groups that will accompany the cattle in the parade are the Bexar County Palomino Patrol and Drill Team; Harris Stage Lines from Paso Robles, Calif.; the Fort Hood 1st Cavalry Division; the Fort Sam Houston Caisson unit; Texas Heritage Riders; and Bexar County Sheriff’s Mounted Patrol. Also on Saturday is the second day of the first Vaquero Cook-Off, where Mexican rice, charro beans, carne guisada, and menudo will be served noon-9 p.m. at La Villita’s Maverick Plaza. The Vaquero Cook-Off starts 5-9 p.m. Friday. The San Antonio Stock Show and Rodeo donates more than $198 million in the form of scholarships, grants, endowments, junior livestock auctions, youth western art auction, calf scramble program and show premiums to San Antonio and Texas students and youth, according to the rodeo website.